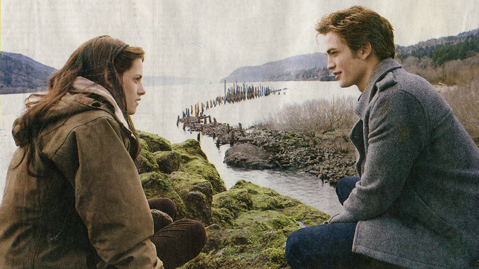 Here’s a round up of the new Twilight pictures. For the uninitiated, Twilight is a vampire-romance set to be one of the biggest (unexpected) hits this Christmas. It tells the story of 17 year old Isabella ‘Bella’ Swan (Kristen Stewart) who moves to a small town in Washington to live with her father. There she falls in love with a classmate, Edward Cullen (Robert Pattinson), who is revealed to be a 108 year old vampire (it’s probably time for him to give up on graduating). But before she can tell her dad her new boyfriend is old enough to be his father, three nomadic vampires, James (Cam Gigandet), Victoria (Rachelle Lefèvre), and Laurent (Edi Gathegi) turn up, putting Bella’s life in danger. Edward and his family, Alice (Ashley Greene), Carlisle (Peter Facinelli), Esme (Elizabeth Reaser), Jasper (Jackson Rathbone), Rosalie (Nikki Reed) and Emmett (Kellan Lutz) are forced to put their lives at stake to save her. Twilight is based off the first book in a series which has become a phenomena for young adults, selling a massive 8 million copies worldwide. The fan base is fanatical and mainly female. The Times claims author Stephenie Meyer has knocked J K Rowling off her throne as queen of young fiction. Leave your thoughts on the Twilight pictures and trivia in the comments. did the director care her picture was being taken? Most important fact of this article: Kristin Stewert is 18. Is it just me, or is it totally lame if vampires just walk around in the day like normal people? Bram Stoker must be turning in his grave. Wow, I was happily surprised to see the new movie poster of James among the others. Definitely looking forward too seeing this movie in theaters this November! so are they going to mike this a 4 movie series or will all the books be crammed into one movie? I know this is going to be a blockbuster movie, and before anyone else makes a comment about the “Twilight Saga” they really need to read the books first., then post your comment. @ Shawnee…just so you know a blockbuster is Technically any film that grosses over $100 Million dollars. While i’m sure the books are Excellent. i am a production assistant at Universal and just saw a screening…the Movie…not so much. I doubt the movie will make $100m thereby making it a blockbuster…there are a lot of fans yes, but…time will tell. He is the most hideous choice for edward that they could have chosen. Sick Sick Sick. Edward is not ugly! EDWARDS HOT! There is no man that can match Edwards description, because Edward is a vampire, so you need to shut your mouth, and think before you speak/write! i personally think that unless stephinie myer directs the movie herself the movie would not be that great. but as a die hard twilight fan I can’t wait to see it. movies are never as good as the book! I LOVE EMMETT IN THIS MOVIE AND IN THE BOOK,,BUT THE GUY WHOS PLAYING EDWARD IS UGLY!!!! AND THEY MESSED UP DIFFERENT PARTS IN THE MOVIE..LIKE WHEN SHE SAY THAT SHES NOT SCARED OF HIM AND HE SAY U REALLY SHOULDNT HAVE SAID THAT AND THEN THEY JUMP OUT THE WINDOW! !THEY ARE SUPPOSED TO DIVE INTO HIS COUCH!! I MEAN EVEN BREAKING DAWN WASNT THAT GOOD!! !HAVE THE TIME I DIDNT WANT TO READ IT BECUZ IT WAS SO DEPRESSING!! !